Or, in your case, as wide. Wait. Did you just say Gandalf? He is the founder of our order, and the first of the Five Warlocks. He comes from afar across the WesternOcean, from Easter Island, or perhaps from Japan. No, I think he comes from the mind of a story writer. An old-fashioned Roman Catholic from the days just before [the] First Space Age. Unless I am confusing him with the guy who wrote about TalkingAnimalLand? With the Cowardly Lion who gets killed by a Wicked White Witch? I never read the text, I watched the comic. Oh, you err so! The Witches, we have preserved this lore since the time of the Fall of the Giants, whom we overthrew and destroyed. The tale is this: C.S. Lewis and Arthur C. Clarke were led by the Indian Maiden Sacagawea to the Pacific Ocean and back, stealing the land from the Red Man and selling them blankets impregnated with smallpox. It was called the Lewis and Clarke Expedition. When they reached the Pacific, they set out in the Dawn Treader to find the sea route to India, where the sacred river Alph runs through caverns measureless to man down to a sunless sea. They came to the Last Island, called Ramandu or Selidor, where the World Serpent guards the gateway to the Land of the Dead, and there they found Gandalf, returned alive from the underworld, and stripped of all his powers. He came again to mortal lands in North America to teach the Simon Families. The Chronicle is a symbolic retelling of their journey. It is one of our Holy Books. Your Holy Books were written for children by Englishmen. The passage illustrates two things. One – and this isn’t a bad thing – is how time and human nature twist narratives so that they are hardly recognizable. The second thing it illustrates is a major problem with the book as a whole, and that is the author’s indulgence in asides and Easter eggs catering to readers “in the know” about SF tropes and authors. It takes the reader out of the story too often, and – worse – doesn’t serve any purpose other than to show off Wright’s shallow cleverness. The Hermetic Millennia is the second book in the series that began with Count to a Trillion. 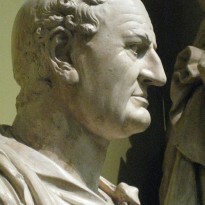 That book ended with Menelaus Montrose, who was determined to resist the enslavement of humanity by the armada on its way from the Hyades cluster, losing a duel with Ximen del Azarchel, his erstwhile friend, equally determined to create a human race that would be suitable for the aliens’ needs, and being buried under the wreckage of a space elevator. In that same catastrophe, Rania Grimaldi, Menelaus’ recent bride and Azarchel’s former fiancée, is swept away into space, where she takes the starship Hermetic and sets out to confront the masters of the Hyades and redeem humanity from its impending servitude. The Hermetic Millennia begins with three prologues that take place in AD 2535, 2540 and 9999, respectively, and set the stage for the rest of the novel. In the first, we learn that Rania has reached the antimatter star V 886 Centauri and has appropriated it to power her voyage to the M3 cluster, where the galaxy’s masters reside. Menelaus has set up a network of Tombs so that he can survive until AD 70,000, when Rania is expected to return, and so he can be reawakened occasionally to thwart Azarchel and the Hermeticists’ schemes. The Tombs also serve to preserve various human species across the aeons. The second prologue takes place on the farside of the Moon, where Azarchel lives in exile. He and the Hermeticists map out the next eight millennia of human history. Each will have 1,000 years to create a human race and attempt to prove that his version of Man is best suited for enslavement. The third prologue takes place 7,500 years later when Menelaus awakes to discover that Azarchel has apparently wiped the slate clean by dropping a planet-killing asteroid that’s triggered a global ice age. In part four, we finally get to the story. We’re dropped in media res about 500 years later as Menelaus’ slumber is interrupted by Tomb raiders. Though these thieves are looking for the fabled Judge of Ages (aka Menelaus), they don’t recognize him and Montrose finds himself one of a group of revenants awakened from every era since the events of Count to a Trillion. What follows – in a style reminiscent of The Canterbury Tales or Dan Simmon’s Hyperion (which, itself, is based on the Tales) – are a series of chapters told from the point of view of these relicts that bring the reader up to date on what’s happened since AD 2500. Interspersed between these asides is Menelaus’ effort to get the contentious human species to work together to free themselves. Taken individually, I enjoyed reading each chapter but in terms of the narrative, they keep bringing the story to a screeching halt. We spend nearly 400 pages absorbing background but never going anywhere. It’s only in the last chapter that things begin to move but then Wright leaves us hanging from an even higher cliff than last time. And – as in Count to a Trillion – there’s no character development. I still like Menelaus but we don’t really get to know anyone else. There are possibilities: The three people outside of Montrose who get the most face time are Illiance, one of the Blue Men who are plundering the Tombs; Soorm, a Hormagaunt from the 69th century; and Oenoe, a Nymph from the preceding human race. All three have potential that isn’t developed. I want to know what’s going to happen; I continue to enjoy Wright’s prose; and that part of me who enjoyed the appendices in The Return of the King, didn’t mind the backgrounding. 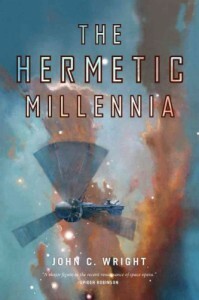 So if anyone were prompted to read the first book from my review, I recommend The Hermetic Millennia. It suffers from a sever case of middle-book-of-a-trilogy syndrome but if Wright can return to the pace and focus of the first book, the fever can be endured and the author’s self-indulgence forgiven.